It is little known today that in ancient times, when man was younger and wiser, the word to �steal� was unknown in any language. The Masters of Wisdom then lived openly among men and encouraged them to live without crime. No door was locked and sharing was the norm. For long ages, in many areas, this blessed state pertained. How far from that simple splendour has man fallen. How far from his purpose has he strayed. Man today is standing at the crossroads: one path, the path of separation and cleavage, on which man now stands, leads unerringly to perdition. The other beckons man towards the fulfilment of his destiny, the wonder of which today cannot be described, a path on which man will find within himself the means of becoming a God. To help men choose, to aid their judgement, the Masters are, once again, returning to a world in which They, too, struggled and suffered as do men today, uncertain of the path and the needed action. From Their vast knowledge and experience They will offer Their advice, and guide men safely back from the abyss. Thus will it be, and thus will men begin again the upward climb to the mountain top, sure in the knowledge that their Mentors, their Elder Brothers, will not desert nor mislead them. When men take the decision to share together the produce of this bountiful world, an extraordinary and mysterious happening will take place: at a stroke, men will realize that the need for war is past, the menace of terrorism will quickly disappear, the trust engendered by sharing will make the problems facing men, environmental and territorial, resolvable in blossoming goodwill. Through sharing, men will realize that they are brothers, and acting as brothers in close co-operation, will begin the process of transforming this world. Thus will God�s plan for men and planet Earth regain its momentum, and thus will men grow apace in wisdom and love. They will rediscover the secret of living in all its simple grandeur and dignity, respecting each man�s right to be and live in harmony. They will come together in veneration of God�s plan and purpose, and add their insight and longing for truth to the annals of men. Maitreya and His group of Masters stand ready to help men in their hour of need. Patiently, They await the moment when They may enter the affairs of men and, with discretion, within the Law, give of Their bounty and aid. That moment is not far off. Q. Do you think President Bush will be voted out of office? A. It is too early to say. My guess is yes, very likely. Q. Is it likely that a Democrat will take his place? A. It will be either a Democrat or a Republican! Q. (1) The new US electronic touch-screen voting machines are, by many expert accounts, open to tampering and votes cast are not safe in that they can easily be changed. Do you think that this is likely to happen in the forthcoming Presidential election? (2) What can US citizens do to avoid another �fixed� election result or another stolen election? A. (1) Yes. (2) They could refuse to use the new machines and insist on changing all defective machines now in operation. Q. The present British Government with Tony Blair as Prime Minister came to power with a huge majority and was very popular, representing people�s hope for a better, fairer society (after 17 years of monetarism, and Thatcher�s �no such thing as society�, explicitly divisive �every man for himself� policies). Now, it seems that hope has been betrayed. (1) Could you give your opinion about what has happened to Tony Blair and the government? (2) What should they do to regain the country�s trust? A. (1) Tony Blair, in my opinion, is suffering from illusion which is feeding his ambition. He has genuine aspirations but is too attached to his illusions to realize them correctly, and too arrogant to take advice from others. He, like President Bush in America, is lying to the people on Iraq. (2) Apologize and tell the truth. Q. The present world tension is making me tense and nervous but I don�t want to let myself be influenced or sucked into extreme fear. (1) What could I most usefully do so that I stay positive? (2) The world seems rather mad at the moment; do you think it will last long? (3) Will the current world climate delay Maitreya�s emergence? A. (1) Practise meditation and detachment and work for a cause. (2) No. (3) No. Q. Forty years ago Martin Luther King�s powerful speech of his dream of equality, justice and peace for all races had an enormous impact and has had a positive effect on race relations around the world. Can you explain why that speech is so moving and powerful? A. Martin Luther King was a second-degree initiate. He spoke from the heart and touched the deepest aspiration of millions of people for unity, justice and brotherhood. Q. (1) Do you think Martin Luther King�s dream is attainable? (2) Will it take a long time for true equality and brotherhood to prevail throughout the world? A. (1) Yes, it is inevitable. (2) The presence of Maitreya and the Masters of Wisdom will stimulate and speed up this process. Q. What on earth are the solutions to the chaos in Iraq? A. The Western powers should withdraw from Iraq and let the United Nations use their experience and aid to restore order under true Iraqi (that is, not a group of puppets of America) Government. Q. UN Secretary-General Kofi Annan seems to be a dignified, idealistic man but is he not out of his depth and being marginalized by the US administration? A. To an extent, yes. However, nothing remains the same. Time will change all things. Q. It seems inevitable that even larger mass demonstrations must and will soon take place around the world � to call for an end to barefaced murder of Palestinians, for instance, or to demand an end to the �reign� of leaders who do not listen to the wishes of the electorate, to call for the end to constant threats of nuclear catastrophes, wars, corruption, injustice, etc. Do you have any insight into what it will take to trigger such mass demonstrations again? A. The peoples of the world are only beginning to realize that they have a voice � and therefore power � and must be encouraged to demonstrate unceasingly until the governments of the world respond. It is part of Maitreya�s work to stimulate and educate the people to demand their rights. That is what the UN Charter is about. Q. Are you still optimistic that the Lord Maitreya will start giving his major television interviews soon? Are you allowed to give any indication about how soon that may be? A. I am optimistic but patient. It will be as soon as ever possible. Q. What can I do right now? A. I have one hundred per cent conviction that what I say is true. Maitreya, the World Teacher, is actually present in the world. There are 14 Masters, eventually there will be 40 Masters in the world. If you believe that, even as a possibility, make it known to everyone who will listen. Do not ram it down their throats, but make it known. It is the best and most important thing you can do. In this way you can help to prepare people for Maitreya�s emergence and create the climate of hope and expectancy. There are many questions along the lines of �What can I do, I�m only one small individual.� You are not just one person. You are one of millions all over the world; millions of right thinking people of goodwill. Join them. They, like you, want peace in the world and know that it is the injustices in the world that prevent peace. Make it known. Join with others, join groups. Humanity is a tremendous force for good and the changes will take place through the raised voice of the people. The voice of the people of all nations rising up, inspired by Maitreya, led by Him, activated by Maitreya � whether they know He is Maitreya or not. The united will of the people will force the governments to change. Q. At the recent September 2003 Amsterdam lecture did you mean to say that terrorism is a logical or acceptable reaction to injustice? A. No, not at all. Nothing which I said about terrorism was meant to convey that it is an acceptable action. I was explaining how it comes about. But that does not mean to say I think it is acceptable. It is a terrible and a wrong reaction, but nevertheless, it is a reaction. So, if we want to be realistic about it we have to understand the causes. Q. Mr De Mello�s dying words were �Don�t let them pull the [UN] mission out� [of Iraq]. But if the majority of Iraqis see the UN as being nothing more than a US-run organization is it responsible to expose the UN workers to more danger? A. The majority of Iraqis do not see the UN as �nothing more than a US-run organization�. Negotiations between the UN and the Iraqi leaders must take place to ensure that a viable UN mission (dispensing aid and succour) can function securely. Iraq is not a secure place now for anyone, but the UN must act nevertheless. They cannot do too much immediately but they should not delay too long. On 13 September 2003 my husband, sister and I went on holiday to Rome. I used a wheelchair because I can only walk slowly and not too far. After visiting the Vatican we were on our way to the Trevi Fountain. Whilst walking along the road an elderly lady passed us � she was disabled and blind in one eye. I noticed as we passed she had a small bowl with her. I asked my husband to stop, got out of the wheelchair and with my sister went to give her some euros. I wanted to say �God Bless you� but thought she was Italian and maybe didn�t speak English. Some time later we were still walking towards the Trevi Fountain but having difficulty knowing which way to go. We reached a street which was a little isolated. I crossed the road to see if I could ask someone if we were on the right road. Suddenly a beautiful young man came by. I quickly stopped him and asked him the way. He said: �If you have a map, I will walk with you to the Fountain to show you the way.� He said he was from the Philippines and was a student in Rome. He pushed me in the wheelchair to the Fountain and when we arrived he would not take any money from us at all. He leaned towards me with beautiful eyes and a lovely smile and said he did it as an act of kindness. We can still picture his lovely face and the peaceful and loving vibrations that came from him. Were the lady and man possibly Jesus and Maitreya? Mrs M.A.L, Sutton Coldfield, UK. On Monday 23 June 2003 at around 3.15pm Lisa and I were walking up Clarendon Road toward Hove station after Transmission Meditation at her house. As we were talking two young schoolboys said something as we walked past. Lisa stopped to talk to one of them, who was about 13 years old with short black hair and a backpack. He then embraced her with a hug and motioned toward me to do likewise. I refused (thinking he must be a friend of Lisa�s eldest boy), but he said: �C�mon, a hug for you as well,� so we briefly embraced. It all seemed to happen and be over so quickly. As we both walked away, we commented on how unusual it had seemed. I presumed the boy was a friend of Lisa�s son but she assured me she had never seen him before. We both wondered with a smile afterwards, could this have been Maitreya? R.E., Worthing, West Sussex, UK. Q: It seems that some people are born healers who devote their lives to healing work. What is your comment on what kind of people they are and what kind of attitude they should maintain when working as healers? This question includes professional psychological help such as a counsellor might give, not only physical healing but help on a much wider scale. There are seven energies which fall into two main lines of energy; these are rays 1, 3, 5 and 7 and rays 2, 4 and 6. The rays condition us. That is why 70 per cent of people are natural healers (because 70 per cent of the world�s population are responsive to rays 2, 4 and 6). For the remaining 30 per cent it is not �the line of least resistance�, although many on this ray-line do healing of some kind. The rays will determine what kind of healing the person is better suited to or more inclined to be in. For example, if your make-up is along the 2, 4, 6 line you will tend to have an easy contact with the soul, but you may find it difficult to work in the outer world. If you are conditioned by rays 1, 3, 5 and 7 you will find it easier to work in the outer, physical world; you can manipulate matter more easily, but you might find it difficult to make contact with the soul. Modern psychology recognizes these differences and describes both the introverted and the extroverted person. The introverted person in a particular life (this may differ from life to life) is a person who has easy and direct contact with the soul; he will almost always be along the 2, 4, 6 line in that life. Likewise, someone who is very good at making money, doing business, dealing very well with the outer world may perhaps have very little contact with the soul. Such a person is most probably influenced by the rays 1, 3, 5 and 7. The more evolved the person, the greater his versatility. The initiate can at will be introverted or extroverted. So, when necessary, he can turn inwards to the soul, to meditate, to do healing and also at will go outwards and deal with the requirements of the outer world. Most people are one or the other. They either have good contact with their soul, or they have good contact with the world; the challenge is to bring both of these into balance. If, however, you were along the 1, 3, 5, 7 line but were interested in healing � and almost everybody has the capacity (but as I say 70 per cent have a better capacity than the other 30 per cent) � you might heal through surgery. Surgery would be the form of healing dealing with the dense-physical plane. According to the Master DK, surgery today is the most advanced form of healing. It is not the most advanced form of healing per se or ultimately but, at the present moment, it is more advanced along its line than the other forms of healing are along their line. Besides surgery, physical-plane healing through the 1, 3, 5, 7 line would include many doctors of medicine, orthopaedics, acupuncture, massage, diet, water therapy, etc, etc. Healers, of course, work on different levels, depending on the point of evolution reached. Much healing is done using etheric and/or astral energy. Much uses soul energy, invoked either from the healer�s or the patient�s soul, either consciously or unconsciously. Many healers are mediumistic and channel astral energy from individuals or groups on the 5th and 6th astral planes. True, �spiritual� healing of a scientific kind comes from various Masters of our Spiritual Hierarchy. The healer does not �do� the healing but is simply a channel for healing from the higher source. The Masters use etheric (all four planes) and spiritual or soul energy as required. It is important to realize that the Law of Cause and Effect (the Law of Karma) governs all phases of the healing art. All healing energy comes essentially from God. God does not tap one on the shoulder but works through agencies; the Masters are one of the main agencies. Much healing today is done without science, without understanding. People long to heal, and this is a good thing because healing is necessary, and nearly everybody has the capacity. But unless they have the necessary knowledge they could be acting against the requirements of the person they are trying to heal. Or it might be wasteful, not in economic terms but in terms of energy, time and so on because they do not know enough about technique. Technique, even in so-called spiritual healing, is essential. You have to use energy intelligently otherwise you are working in the dark. You are working from your emotions. You want to heal. You want magic. It is not magic; it is science. Q: Would you say then that there are people who would be better advised not to try healing? BC: People who are particularly attached to achieving a result, or being admired as a �healer�, may have too many illusions about themselves or be too unhealthy safely to give healing. Detachment is essential. There are several obstacles in the way to further understanding of healing, and therefore, greater efficiency. And I would say, first of all, that I do not believe that much healing is done at all. What is done is amelioration, not true healing. What blocks healing in psychotherapy is that humanity is waiting for psychology, as a means of understanding human nature, to accept the fact of the soul. Since Freud and earlier, the fact of the soul has been rejected by most psychologists, with the exception of Jung and a few others. Most influential psychologists, especially Freud, rejected the idea. However, there is now a growing tendency to take it into account � even if they do not call it soul. People like Winnacott (English psycho-analyst, 1876 - 1971) call it something else, such as �the true self�. There is a growing understanding that the soul exists and what they are seeing on the physical plane is the activity of an entity whom they are too shy, too ashamed, to call the soul because it sounds too religious. It is not religious. It either exists or does not exist. It is known and named within religion and it exists apart from, and outside of, religion. Until psychotherapy accepts the fact of the soul it will not make very much progress in the healing of the disturbances of the mind. What healers in general, the professionals, do not seem to quite understand or to take seriously is the fact that we live in an energetic universe. Everything is energy. Everything we see, however solid, is energy vibrating at a certain rate. The rate of vibration determines the form. Healing is waiting for the understanding of what disease is, what makes disease. You cannot cure disease until you know how it comes about, what it is and what causes it. Q: Could you say how disease comes about? BC: It comes about from an imbalance of energy. If you create a balance of energies you get rid of the disease, but how do you do that? You have to understand how energy works in the physical body, for example. Our present science understands only three levels of what we would call physical: solid physical, liquid physical, and gaseous physical. But above gas there are four further states of physical matter called the etheric planes of matter. They are normally invisible unless you have etheric vision. Maybe some children see them and they are not listened to; they are misunderstood. Q: Where does the soul belong in the etheric field? Because in my mind the soul is part of the light and it may reside in the body in the etheric or in a higher level than the body. BC: The soul uses all levels of the physical body. There are seven levels; we know three, but there are four more. For the science of healing to make any progress, understanding of the etheric levels of matter has to come about. People have to know, doctors have to know in order to be proper doctors, to be efficient in healing, not working in the dark, they have to know how the energies come from the soul. But the soul does not exist in the etheric body. The etheric body is the physical vehicle for the soul to use at this level. We are literally souls in incarnation. The soul incarnates over and over again. It creates in the womb a body for its incarnational purpose and it gives it certain rays. The ray of itself, the ray of the soul, is always the same. But the other rays will change: the physical body, the mental body, and the astral body can change from life to life. This is all created by the soul in the womb each time the person comes into incarnation. You have to understand the mechanism by which the energies of the soul reach the outer world. They reach it directly, or they reach it in a distorted fashion in the use or misuse of the energy so that disease is created. All illnesses are created by misuse or non-use of soul energy. If you do not use the energy of the soul, eventually some kind of disturbance or �dis-ease� is created. If you use it incorrectly, then again eventually a disease or disturbance is created. Q: How does soul energy enter the physical body? BC: The energy from the soul works through the chakras or force centres in the etheric body. The chakras are seven centres from the top of the head to the base of the spine. These are seven main inlets and outlets of energy from the soul to the outer world or from the outer world to the soul. It works both ways. The aura of the person is infused by the energy from the soul, from the mental body, from the astral body and is circulating in and out of the chakras. When it is doing this efficiently, when the energy from the chakras is coming correctly with the right amount for that chakra and so on, not too much, not too little, not static (it must be flowing all the time), then it creates an aura which is in equilibrium. Then you do not have disease. Disease is created by disequilibrium. The equilibrium is upset by too much energy going through a particular chakra, or not enough energy going through. Or the energy is static, not moving at all. When it is static, it sets up the condition for illness of some kind. These chakras are related to the endocrine system, the glands of the physical body, and from the glands to the various organs of the body. And so if you want to cure the organs, which is what most doctors are trying to do, the heart or the liver or the spleen or the kidneys or whatever, you have to understand whether the organs are getting enough energy and from which chakra. Are the chakras open? Are they doing their work? Is there a stasis, a lack of movement? And if there is the energy from the soul, is it being interrupted and blocked in its function? That is what makes disease. So to cure disease the healer has to understand the chakras, and the use of the chakras, and the energies from the chakras to the gland to the organ, and most people do not know this. When the Masters are working more openly in the world more and more doctors and healers of all kinds will turn their attention to the etheric plane. The world is waiting for a true understanding of the etheric plane of matter; it is still matter but finer matter than we understand at the present time. When this is understood, then disease can be tackled. It may take 200-300 years to rid the world of disease, but it will happen. People will understand more and more. The same applies on the psychological level. It is the same energy, and it is either being used well or not. Some people are ill simply because they are doing nothing. The soul is pouring energy in, and they are not using it. They do nothing. The soul is saying, �Serve! Serve!� That is why the soul comes into incarnation: to serve the Plan of evolution. But if the person does not do it, they get ill, and they do not know why they get ill, nor does the doctor know why. But it is simply that they are not active enough in their life. Q: What part does the nervous system play? BC: There is a subtle function of the soul in the physical body that is not understood. The link between the soul and its appearance in the physical body is through the nervous system. The nervous system is made up of �threads� that run down the spine and out into the tips of your fingers and toes. All of the nervous system is there to carry the energy from the soul. Each of the threads or nadis, as they are called, of the nervous system is hollow and is filled with gas. That gas comes from the soul. It has never been discovered scientifically, but it will be, and then people will understand how the soul infuses the whole of the physical body with its energy. The nervous system is, as it were, the highest aspect of the physical because it is the link between the soul and the physical body. It is physical, but inside is the gas of the soul, and that carries the purpose of soul or the particular quality of soul light into the physical body. This is waiting to be discovered, and when it is discovered healing will go higher and higher. There will be a great advance in the capacity to heal. Q: Where does the soul exist? BC: The soul exists on the highest sub-plane of the mental plane. There is a level called the causal level. The body of the soul � the causal body � exists on the causal plane. The causal plane is the fourth sub-plane of the mental plane. The soul�s energy infuses the whole of the system through the chakras. The chakras are like doors through which the energies come and go from the soul and come inside too. It is a two-way system. Q: Can one read more in your books? BC: There is not much more in my books. The best book that I could recommend and from which most of my information comes, is the Master Djwhal Khul�s Esoteric Healing (through Alice A.Bailey). It is available in English and other languages, published by the Lucis Press. If people are interested in healing, they have to understand where disease comes from. It is a science. It is not only physical. Q: With the present situation after the Iraq war and the violent energy created, the people who are doing healing work especially seem to be affected by that energy in their physical body. How do these negative and violent energies affect our chakras? Is it only the healers who seem to respond to them or just about everybody? BC: Everybody. It just depends how detached you are. Most people are attached, so they are affected. Q: Are healers in particular more upset by this stress and strain? BC: Being healers they are probably more sensitive as people. Their physical equipment is more sensitive; they are more affected, therefore, than others. So they have to learn to be detached. The most important thing for all people, but especially for sensitive healers who want to continue their work of healing, is to learn to do their work without emotional attachment. If they are detached they are not affected by the stress and the strain which they otherwise would suffer because they are sensitive. The more sensitive you are, the higher the level of your awareness; the opposite is also true: the less sensitive you are, the stronger you are on the outer physical plane. A lot of people are not affected in any observable way by this same stress that causes sensitive, thinking, responsive people a lot of pain and suffering. Detachment is the key. Q: What role does karma play in disease and in healing? BC: What most healers do not pay any attention to is the law of karma. The law of karma is basic to healing. People spend time pouring energy into a particular person or giving them lots of drugs or pills of one kind or another and nothing happens. The person does not get any better because the karma does not allow it. Much of illness is karmic � apart from that which is not coming from the misuse or non-use of soul energy. We carry over from previous lives karma which manifests in disease at some level � mental, physical or astral, or a combination of all three. It depends on the individual. If you are carrying this karma over from life to life, if you understand the problem and you understand that this illness may only be ameliorated, not cured in this life, then it might make it easier to accept. The symptoms and the pain or suffering can be ameliorated perhaps with drugs, or with a different approach to life, but the actual illness is there for the time that the karma determines. The person has to learn to resolve the karma, has to give back what is causing the karma. So it is complex. It is so subtle and complex that you cannot give a simple answer or �you just do this� or �you just do that�. You have to understand very deeply the condition of the patient, what is causing the karmic difficulty. This may be the result of the misuse of soul energy or the non-use of soul energy, so that has to be rectified. When it is, then the karma will be resolved and the person will be well without any healing. The healing is in the adjustment of karma. From a Master�s point of view, sometimes the only adjustment of karma can be made through death; death is the cure. It seems a tough thing to understand; for the Masters it is one � not the only way � but one of the ways in which the person is cured. In his or her next life the person will be born without that particular karmic debt, and they start from a higher point without that holding them back. Q: What do you think about asking for money for spiritual (or energy) healing? BC: I do not think one should ask for money for healing. For one thing, people call themselves healers, but they do not do the healing. In every case the healing is done at a higher level, either at astral level by �guides� or groups, or spiritual level by a Master. The so-called healer is only the channel through whom the energy goes. So I do not think the healing should be charged for. However, people have to live. Some people devote their whole time to giving healing, and some people ask for donations. That is not my idea but it is better than asking for a price. They could find some kind of work to make a living and give healing free. 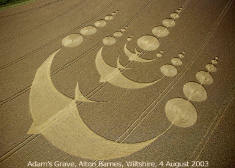 Pictures from: Crop Circle Year Book 2003. Since 1994 Steve Alexander has been taking aerial photographs of crop circle formations in the UK as they have developed from simple circular formations to the extraordinarily complex patterns seen in recent years. With his partner Karen Douglas, he has published a Crop Circle Yearbook annually since 1999, producing a stunning record of one of the most awesome, unexplained phenomena in the world. Gill Fry interviewed Steve Alexander for Share International. 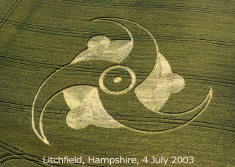 Share International: How did you get involved in photographing crop circles? Steve Alexander: I�d been interested in mysterious things since I was a young boy: UFOs, the Loch Ness Monster and all aspects of the paranormal. I first heard about the crop circles in 1981 but it was only in 1990 when the subject hit the headlines that I became really interested, and in 1993 I started taking photographs. At first it was only ground shots, then in 1994 I took my first flight and took aerial photographs. People saw the photographs and wanted to buy them, so I started supplying aerial photographs. SI: Who do you think makes the crop circles? SA: I have an open mind. When one first enters this subject it is a quest to find out who or what makes them, but I look at it another way now. I think that the crop circle experience is an individual and a spiritual experience. Sometimes it starts as a journey that will change your life for ever ... like a door which opens up different avenues for you, and your life changes. I�ve seen this happen over and over again. Sometimes the change is quite dramatic, and sometimes it can be a small change in peoples� lives. For me it is the after-effect of the crop circles that is interesting. SI: I�ve visited crop circles and noticed a strong sense of energy in the circles and felt energized for weeks afterwards. Do many people have similar experiences? SA: Yes, people who have never been in crop circles before often feel something which they can�t explain, and feel different when they come out. We�ve heard of people going into crop circles with physical complaints, and when they come out those complaints have disappeared � like arthritis or a bad back. Vice versa, some people go into the circles and actually feel quite ill. So the circles seem to affect people in different ways ... it depends almost on your own personal makeup. Other people report seeing mysterious �balls of light� in the crop circles and many people �pick up the energies� with dowsing rods. SI: Have you found that crop circles affect electrical equipment? SA: Mobile phones often work outside the circle, but not inside, and cameras malfunction on a regular basis. I had an experience in 1995 on Telegraph Hill near Winchester. I had two cameras: one was on a pole and one was laid on the ground. Both cameras had new batteries but when I tried to use them the batteries were �dead�. A colleague of mine also found their camera battery was drained. When we got home the batteries were fully charged. Sometimes cameras will malfunction as you are flying over a circle, and watches will stop and start again as you come out of the circle � it�s almost as if you are going into a different reality. SI: Have you heard of anyone actually seeing a pattern being made? SA: There are a few eye-witness accounts of crop circles being made. I heard of a couple who saw some circles form: they felt there was a great electricity in the air and their hair stood on end. There is the famous case in 1996 where a young guy was camping on the ancient fort of Oliver�s Castle and filmed the crop circle being formed � it was caught on video, with balls of light flying overhead. There are many eye witness accounts of the simple circles being made, but not the massive geometric shapes. SI: Have you ever seen a UFO? SA: About two or three definite sightings which I class as unidentified. In other words, I could not say they were anything man-made; they needed another exsssplanation, because of their behaviour. 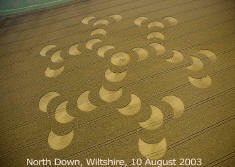 SI: The Wiltshire area has an extraordinary concentration of circles and it seems to be growing every year. How many have you seen or photographed in 2003? SA: This year there have been about 45 to 50 circles in Wiltshire, and around 150-200 countrywide. Some are not reported because farmers don�t want people in their fields, and sometimes they are only found when the farmers are harvesting. Not all the crop circles are by the roadside or visible to the eye, some are tucked away. 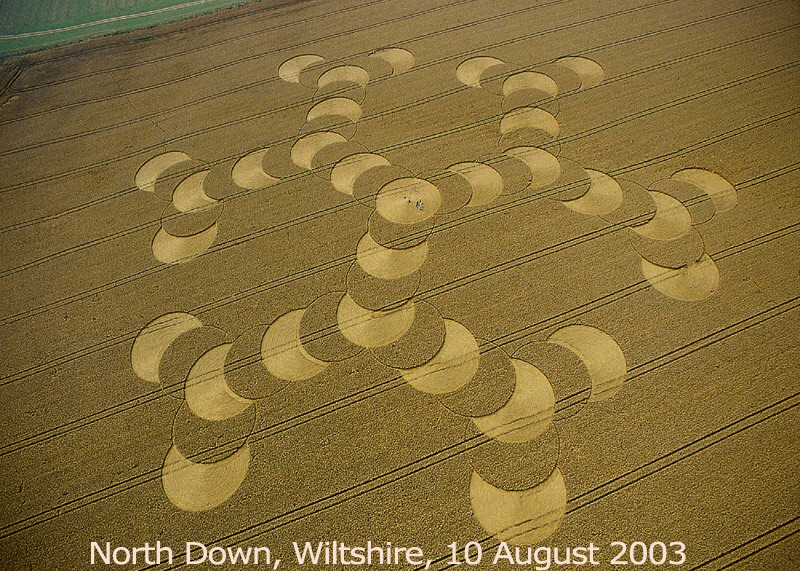 There are also crop circles all over Europe (Germany, Holland, Italy) Canada, the USA � it�s a worldwide phenomenon, but there are more in the Wiltshire area than anywhere else. That is where everyone from abroad comes to see the crop circles. People make a connection with crop circles and ancient sites � Silbury Hill, Avebury and Stonehenge. SI: How do you hear about new formations? 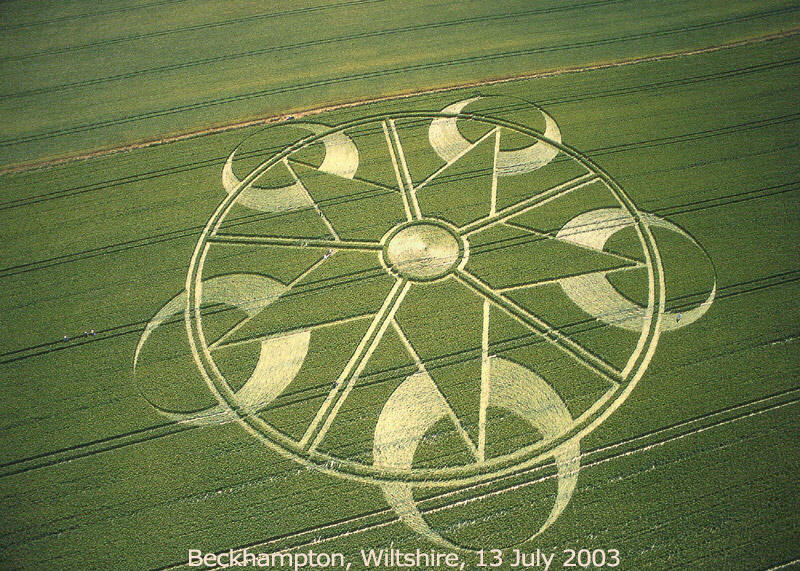 SA: We work with the Crop Circle Connector website and people who look in the fields for circles early in the morning. As soon as they�re reported news comes through to the website and we arrange a helicopter flight as soon as possible, depending on the weather. Sometimes the farmers will cut the patterns out because they�re angry, to stop people going in the fields, so we have to be very quick before the formation gets damaged. It is very intense activity during the season with early mornings and late nights! SI: Have you heard of any farmers being paid to destroy new formations? SA: I heard one story in 1994 where a farmer was allegedly paid to cut a formation out in the Avebury Avenue. Whether that�s true or not, I don�t know. There are a lot of conspiracy theories and rumours which you can�t get to the bottom of. The government are certainly interested in the small �balls of light� which appear around crop circles. Often after the balls of light have been seen, military helicopters appear. They have been seen to chase the balls of light which often shoot off and disappear. This happens quite often so the military may have some sort of monitoring equipment. There is a video showing a helicopter monitoring a ball of light: it shows that the helicopter is aware of the ball of light, then the light flicks out and disappears. I think it�s more than a coincidence that helicopters and the balls of light turn up at the same time. SI: Are there any scientific studies taking place of the crop formations? SA: Nancy Talbott in the USA, who has worked with the Michigan biophysicist Dr Levengood* has done studies of plants taken from crop circles all over the world, mainly concentrating on samples from the USA. Nancy has found some very interesting results which have been published on her BLT website (www.bltresearch.com). She is a very down-to-earth person and has been dealing with the scientific aspects for some years, trying to get respected scientific bodies interested. But it is very difficult: there is a stigma attached and any serious scientist tends to work underground, not publicly announcing that they are interested. SI: The media does not represent the true extent of this phenomenon. Do you present the media with photos of the new patterns as they happen? How do you go about publicizing the information? SA: It�s almost as if the crop circles are now just a space-filler when they haven�t got any other stories. In the early 1990s they were front-page news, but now the media interest has really died. I offer the newspapers the images and any interesting stories but I only got one story in this year (the �swallow formation�) in the Daily Express newspaper. The Daily Mail, which normally takes images, wasn�t interested this year. SI: The media in the UK did a great job debunking crop circles, particularly by reporting the antics of �Doug and Dave� who claimed to make them all! SA: You have to ask the question could these formations be made in the time period � the hours of darkness are very short in the summer and the circles are located in many different places. It starts to get dark around 10pm and gets light around 3.30-4am and some of these formations are enormous. The Doug and Dave story in the early 1990s killed interest almost on that day, and it�s tried to recover ever since. A lot of people thought that was the explanation and left the subject. Before that story broke it was almost like an uprising in spiritual awareness and there were masses of people coming down to Wiltshire and their lives were changing for ever. This was something very tactile: you could go to crop circles, walk in them, touch them, experience them, whereas with UFO sightings you have to be there at the right time to see them. It was very much a spiritual experience for a lot of people and that was killed off by one article in the Today newspaper. Ever since then it has been a struggle for the subject to be taken seriously. SI: It has parallels with Share International�s information about miracles. There was the huge miracle in 1995: over four days Hindu statues appeared to lap up gallons of milk during puja ceremonies in temples all over the world. Scientists were interviewed and �de-bunked� the miracle saying that the liquid must have disappeared due to �capillary action� of the statues � some of which were metal! It was an absurd and unscientific response, but perhaps easier for the public to accept. SA: The scientific community does not apply science to explain these things. I don�t think they can explain them, because it�s �outside their box�, and they don�t have the tools to explain it. They�ve already made up their mind about them and think they know the answer. SI: Various unusual theories about crop circles suggested in the past were hedgehogs mating and wind vortexes! SA: I think the wind vortexes was plausible at one stage, but when they became more complex and had boxes, triangles and different shapes it became totally implausible. SI: Do UFO and crop circle enthusiasts meet and share information? SA: There are two major conferences each year in the UK: the Glastonbury Symposium and the Wiltshire Crop Circle Study Group. There are smaller local groups that get together but most people communicate via email and get their information from the websites. They also meet in the formations: they�re almost like temples where everyone talks and meets with strangers and strike up conversations. If you met on a bus or a train you would completely ignore each other! SI: Visiting the crop circles can be a very uplifting experience. Once you�ve visited them you�re hooked aren�t you! SA: There are a lot of people, even sceptics, who can�t let go � it�s got a hold over them! I do think behind this there is some form of higher intelligence and if you have a positive attitude towards it you�ll get that back � it�s very beneficial. Steve Alexander and Karen Douglas, Crop Circle Year Book 2003. Temporary Temple Press, 2003. ISBN 0-9537446-4-7.